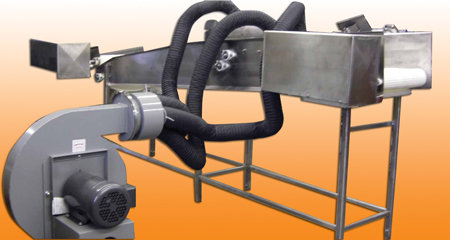 is a CUSTOM BUILT drying system for Lettuce and Mix Products - Adjustable and designed with 1-3 Belt turnovers to flip product, Complete with 3-5 Air Knife Stations. Variable speed belt motor; VFD on a 5-7.5 hp TEFC Fan Blower; 1/2 hp TEFC VFD Conveyor Motor; Gearbox & Electrical On/Off Panel; Composite Bearings; Fiberglass Control Panel Box. 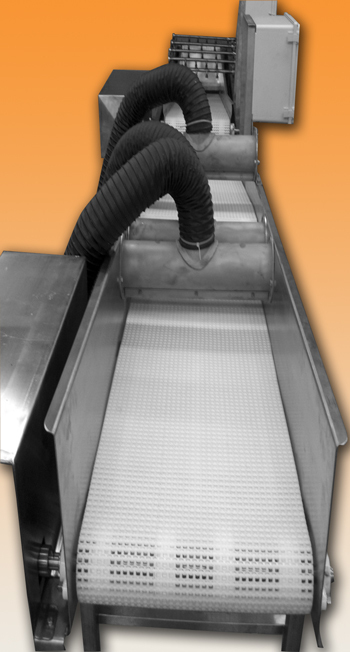 A Flex or Lexon Cover over Air Knives to contain flying pieces.